In this chapter you can find out how to install and configure the UCP IP SMS protocol for SMS messaging using the Ozeki NG - SMS Gateway software. In addition to an introduction containing general information about this protocol, this page provides detailed installation and configuration instructions. As you can read on the Service Provider Connections page, you need to install and configure one or more service provider connections for SMS messaging using Ozeki NG - SMS Gateway. One of the service provider connections supported by the software is the Universal Computer Protocol (UCP) connection. This protocol is often used by GSM service providers for IP SMS connectivity. The currently used protocol versions (v3, v3.5, v4.0) can be used to transfer high volumes of SMS traffic. It is used for both premium rate and normal rate SMS messages. One of the advantages of using UCP connections is that you can specify the sender address of the message. The sender address can be a custom phone number or a short word containing alphanumeric characters. (See the instructions about the overridable checkbox below.) Note, however, that some GSM service providers restrict the use of this option. Another advantage of UCP is that it allows sending messages of every type the GSM network can carry. It can be used to send binary SMS messages (operator logos, ringtones), WAP Push messages, as well as other types of messages. (Check out the Appendix for links to pages about different message types.) Concatenated SMS messages and various alphabets can also be used. In order to use UCP to connect to an SMSC over the Internet or other private TCP/IP network, you need to subscribe to the service of a service provider. Some service providers require you to set up an IPSEC VPN tunnel to connect to their SMSC (Figure 1). In most cases you need a fix IP address, which you have to let the GSM service provider know so that they can give you access through their firewall. In some situations, the service provider does not want you to be able to set up more than one UCP connection from your computer to their service. If this is the case, they might ask you to use a specific source port for the connection. You can install and configure this connection using the graphical user interface of Ozeki NG - SMS Gateway. You can also add a service provider connection by clicking the Add service provider item in the Service providers menu. To select the UCP protocol, click the Install link in the respective entry in the list (Figure 2). When you have installed the UCP Connection, the Configuration panel will show up on the right of the interface. The first tab of the panel is the UCP settings tab. First, specify the UCP server settings. This information is provided by the GSM service provider whose service you have subscribed to. The connection parameters are the host name (or IP address), the port number, a username and a password. Service providers often use the phone number of the service or the port number as the username. Enter the information in the respective edit boxes (Figure 3). Then, specify the telephone number assigned to this connection and the service provider name. To facilitate identification and to avoid confusion, you should name the connection after the GSM service provider. E.g., if you have set up an SMPP connection with Vodafone, it is advisable to name it "Vodafone". Also, note that different connections should be given different names. If you have different connections from the same service provider, you can use different but similar names for them, e.g. : "Vodafone1", "Vodafone2" (or something of the like). However, some load balancing solutions require an identical name for different connections. For details, visit the Load Balancing and the Load Balancing for SMPP v3.3 page. Some UCP servers require login. If this is the case, check the Server requires login checkbox. Enter the information in the respective edit boxes. Remember to enter the phone number in international format: starting with "+". You can check the overridable checkbox to the right of the Telephone number edit box. This ensures that you can replace the phone number specified in the Telephone number edit box with a different one to be displayed as the sender of an outgoing message. You can also replace the number with (alphanumeric) text consisting of a maximum of eleven (11) characters. Therefore, when a message is sent out, e.g. using the Database user, you can specify any different phone number or a name to be displayed as the sender of the message. Note that the phone number to be specified in the Telephone number edit box is a mandatory value. If you leave the edit box empty, and if the outgoing SMS message does not carry a sender phone number either, the sending will be unsuccessful. To perform general settings related to sending and receiving SMS messages using this protocol, click the General Settings tab. This will open a panel consisting of the Sending and receiving, Timeout handling, Communication link management section. In Sending and receiving section you can check any or all of the checkboxes. Which one(s) to check depends on what you wish to use this connection for and whether you need a delivery report. You can choose to use the connection for only sending or only receiving SMS messages (or both sending and receiving), and you can choose to request a delivery report for outgoing messages (Figure 4). In the other sections of the tab you can make choices and specifications to handle your connection to the SMS Center and the status of your SMS messages. In the Submit timeout edit box you can specify the maximum waiting time for an SMS Center response confirming that your message has been successfully submitted. Successful submission means that the SMS Center has accepted the message for delivery. You can specify the waiting time by giving the number of seconds in numerical characters representing any positive whole number. If you are content with the default specification (60 seconds), leave this edit box unchanged. You can choose how to consider a message you have sent if there is no response from the SMS Center after the specified length of time. Select one of the three radio buttons. Select Sent to consider a message sent even if there is no response from the SMS Center. Select Not sent to consider a message not sent if there is no response from the SMS Center. Select Retry later to make the program try to send a message later if the SMS Center has not confirmed its status as sent. Then, the message will be placed last in the outgoing message queue and sent out again when it is its turn. In the right section of this configuration panel you can manage communication links. At first, in "Windows size" line you can increase the window size, if your UCP service provider supports windowing. If you check the checkbox in the Communication link management section, you can make the program send keepalive packets to maintain connection. Proxy servers will drop a connection after a short period of time if there is no activity on it. Keepalive packets are sent during idle periods to keep the connection open. In the Keepalive period edit box you can specify the maximum length of idle connection between the Ozeki NG - SMS Gateway and the SMSC. You can specify it by giving the number of seconds in numerical characters representing any positive whole number. If you are content with the default specification (30 seconds), leave this edit box unchanged. You can also check the Limit speed to checkbox (you can provide the exact time in MPM) if your service provider does not support high speed. To configure logging, click the Logging tab in the Configuration panel. 0 is the default value set by your service provider. If you set 1 in the edit box, Delivery Notifications (DN) are reported only. If you set 2 in the edit box, Non-Delivery Notifications (ND) are reported only. If you set 3 in the edit box, both Delivery and Non-Delivery Notifications are reported. If you set 4 in the edit box, Buffered Message Notificatons (BN) are reported only. If you set 5 in the edit box, both Buffered Message Notifications and Delivery Notifications are reported. If you set 6 in the edit box, both Buffered Message Notifications and Non-Delivery Notifications are reported. If you set 7 in the edit box, all notifications (DN,ND and BN) are reported. Use 0539 and the following (N)AdC (Figure 6). Finally, specify the characterset you preferred: GSM7bit, UCS2, IA5_AO (Figure 7). The Configuration panel for service provider connections contains a Connect automatically on startup checkbox (in the bottom left-hand corner). 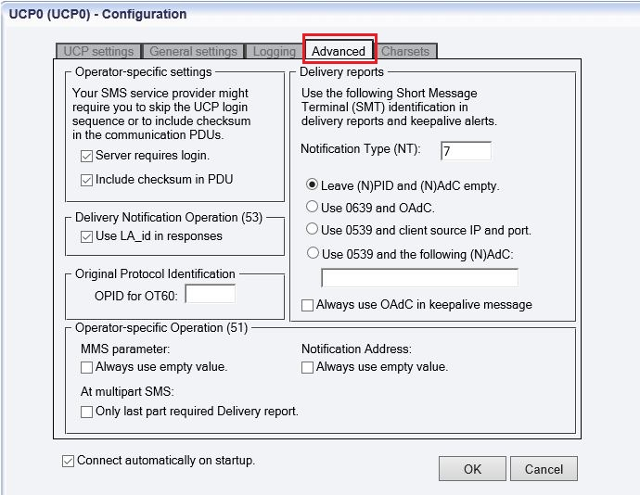 If it is checked, Ozeki NG - SMS Gateway will automatically initiate a connection with the SMS Center when the program has started. If this checkbox is not checked, the connection has to be initiated manually. To initiate the connection manually, click the Connect link in the panel of the service provider connection (Figure 8). You can open the panel of a service provider connection by clicking its name in the Service providers panel in the Management Console.